I guess you can consider this part 2 of my previous post. 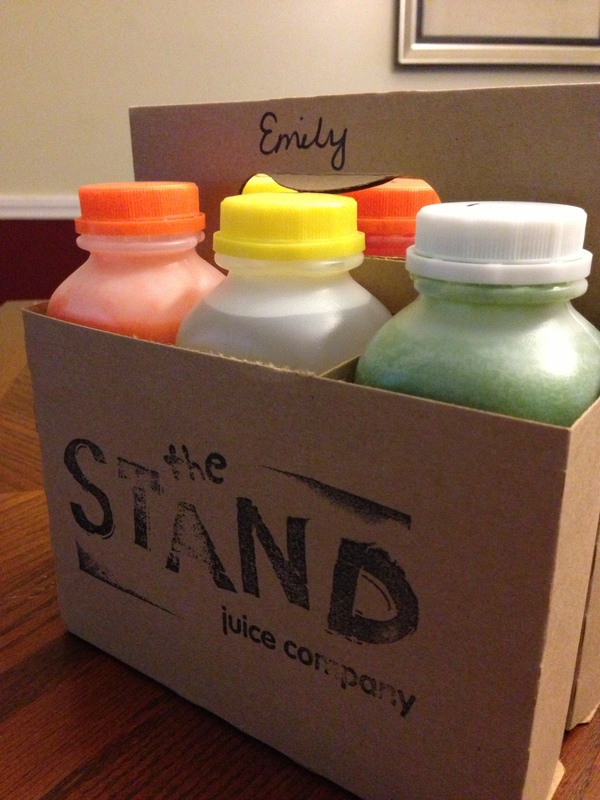 5 day juice cleanse (courtesy of The Stand) is complete. I have so much to share with you, but don’t want to turn this into a rambling post (because I really have that much to say). If you’re thinking of doing a juice cleanse (or are curious about it), then hopefully this post will enlighten you a bit! The juices consumed included ingredients that I wouldn’t normally include in my daily diet. I was exposed to an array of fruits and veggies and learned about the benefits of them along the way. Did you know that cucumbers are highly cleansing and benefits both digestion and circulation? Or that the cinnaldehyde in cinnamon helps prevent unwanted clumping of blood platelets? Or that sprouts are a powerful source of antioxidants? You can’t have caffeine at all during this process. That means cutting out all coffee in the morning, caffeinated teas, drinks, etc. I thought this would be very difficult, considering the fact that I enjoy a rich cup of Sumatra coffee every morning, but I was never tired or exhausted throughout the day. The juices provided me with enough energy to get through the day. I also woke up every morning, well before my alarm went off. I was not groggy and was able to immediately hop out of bed and start my day. I’m going to change my eating habits and start making better food choices. Consuming these ingredients has made me feel healthier and have also inspired me to make healthier choices when it comes to food. I want to consume more raw ingredients. I want to consume more vegetables, greens, and natural foods. Coming off the cleanse, my body knew it wanted food, but it also knew that it wanted to eat a healthy spinach salad. I hope that this mentality continues well into the future. 1. You want to jumpstart a diet. It’s a great way to get you motivated and inspired to start a new diet in your life. 2. You feel like you’ve fallen off the “healthy” track and into a vicious cycle of take out, greasy foods, poor food choices, and want to get back onto the “healthy” track. A juice cleanse is called a cleanse for a reason. This process will help you detoxify and cleanse your body from all of that junk you’ve been shoving into your mouth. 3. You’re the least bit curious about a juice cleanse. What do you have to lose? (If anything, you will lose a few pounds along the way!) Why not experience it for yourself? 1. You want to lose weight and keep it off. I believe that the weight loss from a juice cleanse is only temporary. It’s obvious to any human being that if your body is consuming juices for 5 days straight, that you will lose weight. Yes, it’s true. But, when your body starts to consume solid foods again, you’re going to gain some of that weight back. I lost 9 lbs during this cleanse, but anticipate to gain some of it back once I start eating again. 2. You haven’t done your own personal research on juice recipes, ingredients to use, etc. 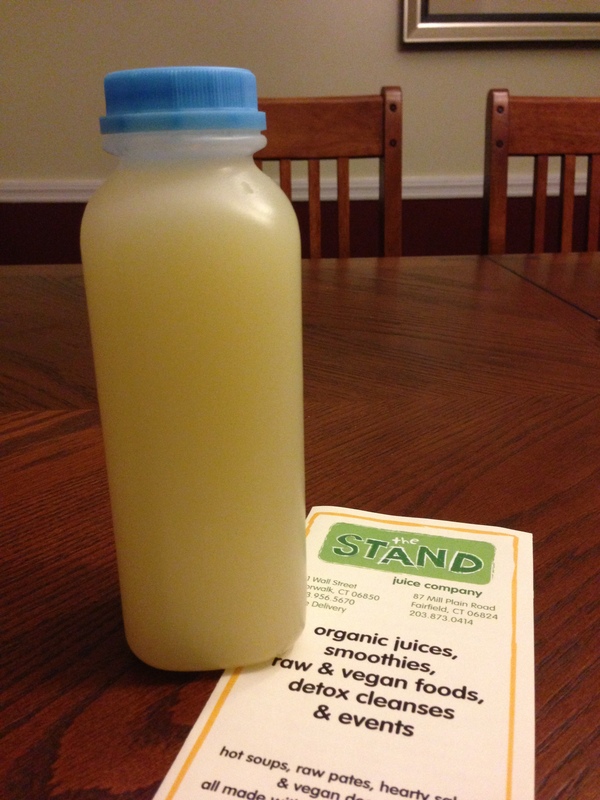 I had the benefit of doing my cleanse through a program that was offered by a local business in town. They offer these programs on a weekly basis and the folks clearly know what they are doing. If you are planning on doing the cleanse yourself, make sure that you clearly understand the purpose of the ingredients used. A juice cleanse isn’t about drinking freshly squeezed orange juice in the morning, a banana strawberry smoothie in the afternoon, and a frothy protein shake at night. It was a great and inspiring experience, but I don’t think I will do it again. Some of the juices made me gag. This is no offense to the awesome folks at The Stand. It’s just…. the ingredients were not really appetizing. Some of the drinks were very hard to consume. But some of the drinks were delicious. I’d also recommend doing this cleanse in the warmer months. All of the drinks are refrigerated, so drinking 6 cold drinks on a 30 degree day, is not really welcoming or refreshing. Now, onto some more fun and delicious Paleo dishes….!!! I’m excited to stock up my fridge with some fabulous ingredients and start cooking again!! My 5 day juice cleanse ended on Friday. I sure was doing my happy dance at the end of it!!! Man, it was tough, but I’m glad I did it. I’m always open to new experiences, good and bad, but especially ones that can help to improve my health. I’ll post about my overall experience shortly…. But until then, I wanted to share one of the first meals that I had to break the cleanse. 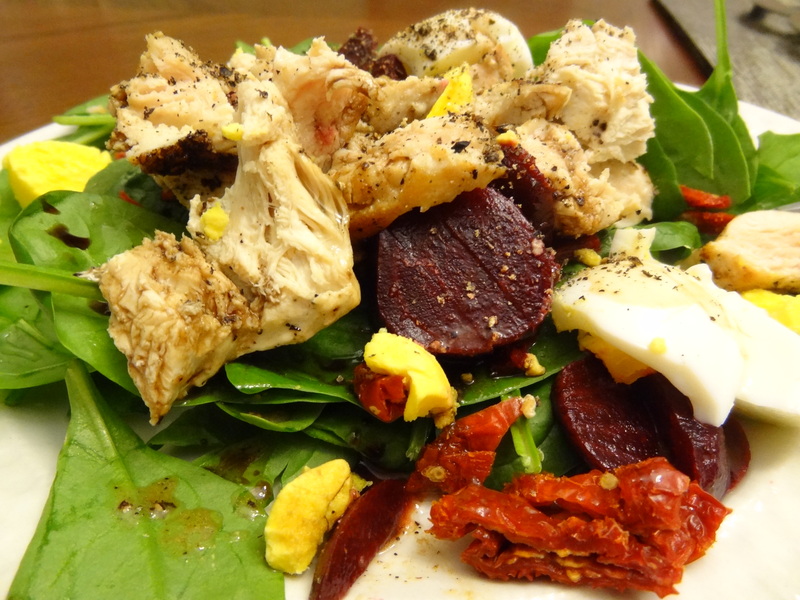 A huge spinach salad, topped with beets (YUM, and my new favorite vegetable), sundried tomatoes, hard boiled (cage-free) egg, and a 4 oz. piece of organic chicken breast (grilled to perfection with some olive oil, sea salt, and black pepper). And last but not least, drizzled with a bit of balsamic vinegar and olive oil. Bjorn: You’re going to eat a salad (out of all things)? You don’t want pizza? Ice cream? A nice juicy piece of steak? Bjorn: It does look really good. Let me try (grabs a fork and dives in with me). Bjorn: If all salads were like this, I’d eat this all the time! 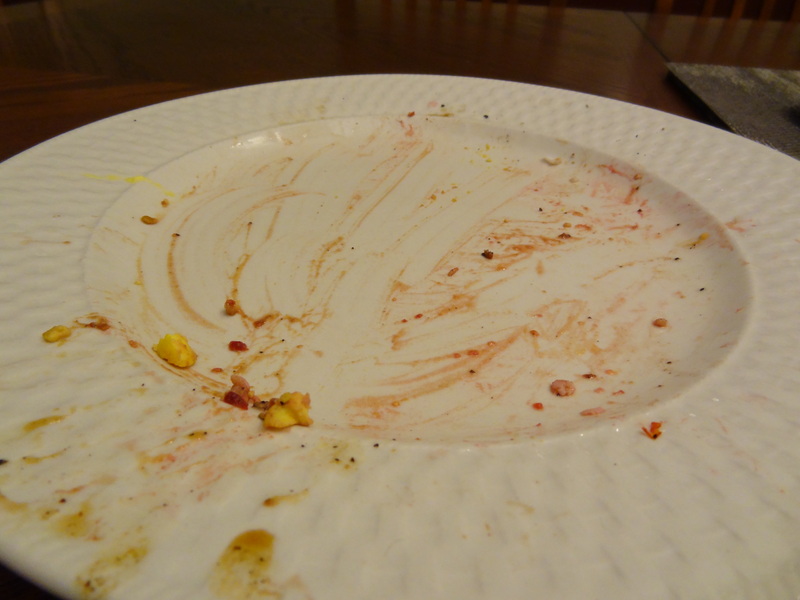 Bjorn: Wow, you must’ve been really hungry…. My Juicing Experience… over halfway there! I haven’t been too busy in the kitchen lately; our kitchen was out of commission for one week, due to loss of power from Hurricane Sandy. And the day we got our power back (this past Monday) was day 1 of my juice cleanse. The cleanse came at the perfect time actually… Due to no power, we were eating out a lot and eating things like chips, cookies, and Halloween candy while camping out next to the space heaters in the living room. Not good. 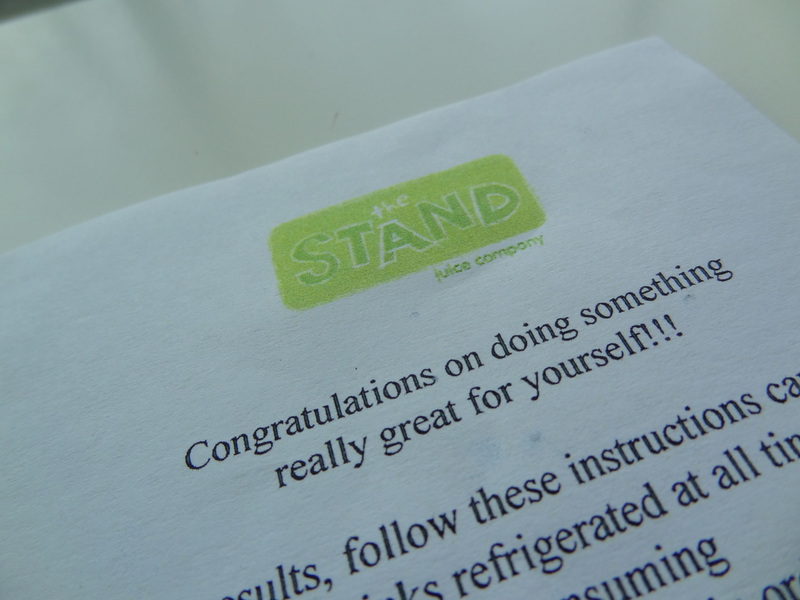 What I really liked about the program that The Stand offers is that they focus on using all natural and organic products. Many people do juice cleanses by consuming drinks made of some powder-y substance and water, which is not natural. All of the juices that I’ve consumed thus far have been made with natural ingredients – cucumber, kale, collards, celery, avocado, lemon, lime, grapefruit, cantaloupe… to name a few. I also decided to do the 5 day cleanse, because The Stand recommends all first time juicers to do the 5 day and then use the 3 day as maintenance in the future. Every morning of the cleanse, I stop by The Stand to pick up a cute little 6 pack of freshly squeezed juices. You have to consume the 16 oz. juices in a specific order and you always get a menu that outlines the ingredients used along with an explanation of the health benefits. It’s very educational. You can always do your own juice cleanse as long as you have a juicer and the ingredients (and the time!). What I like about this program is that it’s super convenient. I looked into doing the juicing myself, but then I’d have to purchase a juicer and stock up on organic ingredients…. And we all know how expensive organic produce can get. And let’s not forget the amount of time it takes to make 6 juices for the day. So, today, I’m on day 3 of the cleanse. Honestly, it’s been pretty easy up until now. I’ve been able to keep myself busy these past few days with going to the gym and yoga after work. Surprisingly, I’ve had the energy to continue with my workout routines. Today, I made dinner for Bjorn and that was seriously hard. I made him Jasmine rice with pork chops marinated in Mama Sita’s BBQ marinade, and some other seasonings. It smelled divine. I really wanted a bite. Actually, I’m lying. I wanted more than a bite. I wanted to take a bowl of rice and that whole pork chop and devour it. But, no. I’ve come this far and only have 2 more days left of this cleanse. I can do it. I’ll report back after day 5 to share my whole experience. Since I’m a little over halfway through, I have to say that it’s been a very intriguing and educational experience. I’m not sure I can say that I love it, but I also don’t hate it. Some of the drinks are delicious (almond milk, lemonade – shown in pic below, cantaloupe soup, limeade), but some of the drinks are very hard to consume (green smoothie made of kale, cucumber, avocado, lemon, hemp oil, kelp). It’s actually kind of awesome because the drinks do keep me full and I wasn’t really craving food. The ideal situation would be to stay away from food as much as possible to lessen the temptations and cravings. Maybe Bjorn can cook his own dinner for the rest of the week, hehe.